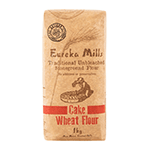 This all-natural unbleached cake flour is perfect for creating moist and delicious home-baked goodies. This flour is made from grain that’s locally grown in the nutrient-rich soil of South Africa’s pristine Helderberg and Swellendam regions. You can forget about GMO nasties, chemical bleaches because the grain is cultivated in a traditional eco-friendly way; that means it’s free of unwanted chemicals and additives.